Most of sources state that shrimp natural habitat is in freshwater bodies in the South of the USA. Here this shrimp composes an important part of river predators diet. However, some of the sources say that ghost shrimp natural habitat is in India or South-West Asia. Frankly speaking, I tend to support the latter suggestion. Moreover, there is no shared vision as for the Latin name of shrimp. In one sources it is called Macrobrachium ehemals, while in others it is called Palaemonetes sp. Which is no surprise, since even when we open Wikipedia, we can see how diversified Glass shrimp species are. Taking into account, it uncontrolled commercial breeding, it is quite possible, that the shrimps you have in your tank are hybrids of a wide variety of wild shrimps. Female is up to 2 inches (5 cm) long, males are up to 1.5 inches (4 cm). Ghost shrimp coloring is completely transparent, that’s why it was called a Glass shrimp. Depending on its diet the shrimp can get yellowish, orange, beige or brown shade. The shrimp tail has small spots on it. There are tiny claws on its first 4 pairs of legs, they help the shrimp to collect the food from the bottom. Its undeveloped small pincers and laced horns only vaguely resemble that shrimp belongs to Macrobrachium kind. Ghost shrimps are incredibly simple to take care of and they can survive at any tank conditions. This is one of the few creatures which not only feels good, but also breeds in a small tank. Of course, it’s better to keep them in a large tank, where they can create their own population, especially in a thickly planted tank. Since most of the shrimps grow not larger than 1.5 inches (4 cm) and they don’t produce much waste in the tank, you should get the filter not for them, but mostly for fishes that live in the tank. The main thing you have to keep in mind is that juveniles are very small and they easily get sucked in with the flow of the water filter, therefore it’s better not to use an external one. An internal sponge filter without a case will be a perfect solution here. Though if you have a lot of fishes in the tank or if you have a large tank you can use an external filter, since in a large tank the chances that small Glass shrimps get into the water filter are sufficiently lower. Comfort temperature for ghost shrimps is 18-29°C (65-85°F). However, they can stand temperature decrease lower than 18°C (65°F). The most preferable temperature for shrimp is 23-24°C (75°F). Higher water temperature leads to increase of ghost shrimp breeding and growing rate. At that higher temperature causes decrease of amount of oxygen dissolved in water. The upper temperature limit acceptable for Glass shrimp is 30°C. At low temperatures shrimp becomes more prone to various diseases. Tank water pH can be within 6,5-8,0. This range ensures the shrimps healthy life, coloring and survival rate. Neutral tap water is excellent to fill the tank with shrimps. Nitrites and ammonia level should be at zero level, since ghost shrimp is very sensitive to nitrites and ammonia content in the water. As for the nitrates level – it should be as low as possible. Frequent water replacement and presence of tank plants can help to support low nitrates level in the tank water. Weekly water renew should be at least 30%. You should also create some shelters in the tank, where the shrimps can hide. These may be some snags, flower pots, tubes or thick tank plants, for example java moss. Ghost shrimps may show aggression towards each other, especially to the smaller ones. Such behavior shows more if they live in a small tank. Therefore, a recommended number of shrimps in a tank – is one species for 4 liters of water. When buying shrimps you should pay attention to their coloring and how active they are. A healthy shrimp is almost transparent and hyperdynamic. Inertness and milky coloring of the shrimp indicate that it was kept and transported at improper conditions and it is likely to die in the nearest future. About two month ago I bought ghost shrimps. They were transparent, about 0.5 inches large. I put them into the tank with soft water together with Red Crystal shrimps. The glass shrimps were ok, they grew fast, eat all the food, especially bloodworm. But when one day there was no bloodworm for them, they attacked Red Crystal shrimps and only very few of them survived. As for the shrimps, they became larger and stronger and even fed on some of their weaker relatives. Now these shrimps are about 2 inches long, have small pincers, like hiding in the tank plants and moss, they come out to get their food and very seldom to swim around the tank. I also saw one of the female shrimps carrying eggs. They were about 30 eggs of greenish color. However, considering all the above mentioned, still it is important to choose small sized and nonpredatory tank mates for a ghost shrimp. Small size and helplessness make the shrimp an easy prey for large fishes. Some of them can even swallow the whole shrimp – for example, that shrimp is a food for Oscar fish (Astronotus ocellatus). Choose not large, peaceful fishes: guppies, molly, tiger barb, cherry barb, neon tetra. Ghost shrimp males and females can be easily distinguished. Firstly, female has a greenish saddle on its back and/or eggs under its abdomen (they look like shining green spots). Secondly, these shrimps have a bulge on their back and female shrimps have rather pronounced curved back. Thirdly, another distinctive feature is shrimp size: female shrimps are larger than males. Length of adult glass shrimp female is about 2 inches, while male is sometimes even smaller than 1.5 inches. Also, look great in planted, structured, freshwater fish tanks. Just take caution that fish will view them as food. It is easy to feed ghost shrimps. They are looking for food on the tank bottom all the time. They eagerly eat leftovers of fish food, they like bloodworm and tubifex, though only an adult shrimp can swallow a bloodworm. In this case you can freeze bloodworm and usually it falls into pieces after this, so shrimp juveniles can eat it as well. You can also feed them with specialized food for shrimps. It is important to make sure that the food gets on the tank bottom and it is not eaten by tank fish in the middle water layer. It is not difficult to breed ghost shrimps. All you need is to have males and females in one tank. The difficult thing is to feed the juveniles, so they grow. The problem is that they are very small and can’t be fed with the food for adult shrimp. As a result, mots of gost shrimp juveniles die of starvation. In you want to save as much as possible of shrimp larva, then put the female shrimp with eggs into a separate tank once you see it. Which isn’t difficult due to its semi-transparent body. You will see small greenish eggs under its abdomen and the shrimp will carry them for several weeks. Once you put the female shrimp with eggs into a separate tank you will have to think how you will feed the larva. The thing is that during the first days the larva does not look like a shrimp. It is very tiny and it swims in the water. It doesn’t even have legs and it swims due to some annexa in the bottom of its tail. During its first days the shrimp larva feeds on infusorian and zooplankton, then it sheds its skin and starts looking like a tiny shrimp. Therefore you should use infusorian or other small sized food to feed the juveniles. 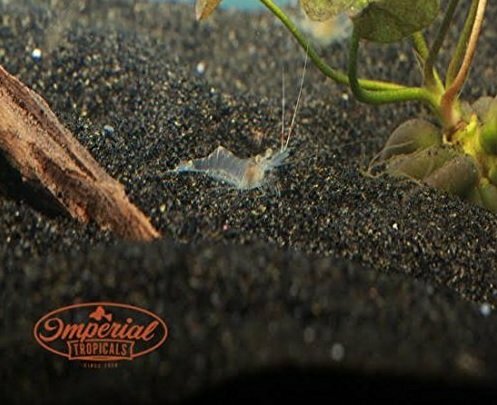 Also you may put some fallen leaves on a tank bottom in advance, since while they are rotting some microorganisms will appear and serve as food for glass shrimp juveniles. Put a bunch of java moss into the tank as well, since lots of microorganisms live there, too. After the larva sheds its skin, you can feed it with artificial food for shrimp juveniles.